Tuesday 31st July 2018 If there are overlapping cellref in the top cell always the cell will be selected with its origin closest to the mouse pointer. In case two or more cellref are place in the same location you cannot select it with the *Select/edit* feature. In that case please use the *cell select* tool with shortcut 'page-up' or inside the select/fine-select menu. With this *cell select* feature a left mouse click will select the reference closest to the mouse. A SHIFT+left mouse click will switch through any cell reference sorted by its distance to the mouse and by using it multi time you can access any reference. Alternative there is a feature to *select cell references by name* or with the *properties* tool you can open list with all elements near the mouse pointer with a SHIFT+ left mouse click and choose the element from this list to edit its properties. Hi Matheu, I also had trouble selecting items when I first started using LayoutEditor. 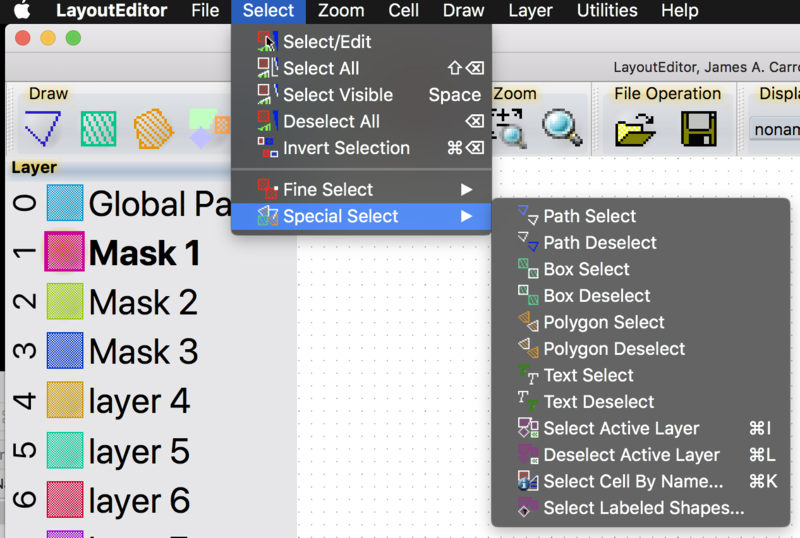 A very useful way to select items is with the SELECT >> SPECIAL SELECT method. This will give you many options for how to select items. For example, you can select items by the type of design element they are (path, box, polygon, text, ...) or by cell name or by active layer.